**UPDATE** I have uploaded all of my materials in a zip file on Google Docs for FREE! Find them all HERE. 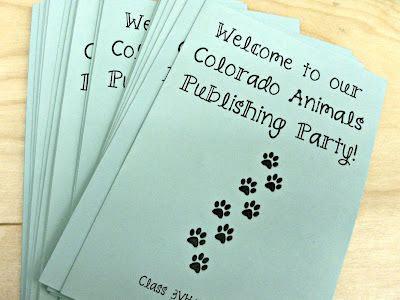 We just threw a HUGE Publishing Party in my room a few days ago that celebrated my students' Colorado Animal Research Projects. It was fantastic! 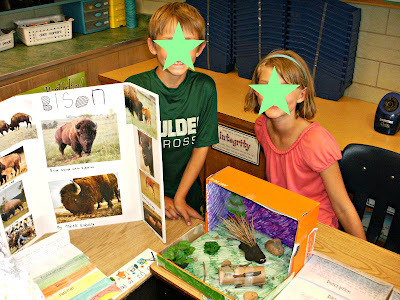 Each child chose a Colorado animal to study and published their research findings into a foldable. Topics included: description, habitat, diet, interesting facts, and a topic of their choice. Some chose predators/prey, others chose what to do if you see the animal in the wild, and others did the different types of their animals both in Colorado and around the world. We worked on publishing their work in class into their foldable and at home, they were responsible for their physical representation- this could be a poster, diorama, model.... anything that showed their animal in its natural habitat. Click on the photo to download your own copy on Google Docs! We created a class rubric together so that it could serve as a guide to kids throughout the process. We made goals and it made conferring with each student very easy. It was great for them to use the rubric as they worked to check to make sure they were on the right path. I also sent a copy home to parents to they knew expectations for the physical representation, as well as what their child was working on at school. Finally, the big day arrived! Kids brought in their projects and they were proudly displayed on their desks, along with their foldable. ...and added their name and animal to the inside. I stayed near the door and passed these out to parents as they entered our reorganized classroom, with desks in a large U so that visitors could wander to anyone's desk and ask questions. I really loved how the open-ended project resulted in each child's representation being different! It was ah-ma-zing to see their hard work come together in such a fantastic way! We do a publishing party at the end of the year. We publish a different project each month throughout the year. After parents view them, I have them returned to school so I can save them for our end of the year party. 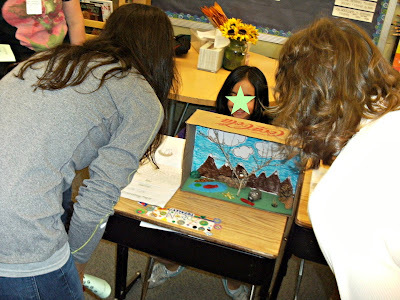 I usually have each student present their favorite piece (or part of it) and then all the third grade rooms browse each others' work. I love your handouts though. That's a great idea! What a cool idea! I will try throwing a publishing party next year. Thank you for sharing. I have not thrown a publishing party yet, but I plan to throw some next year. I love your blog and your creativity! Thank you for sharing such an awesome idea!